DCR Components set a new benchmark in wheel performance. They have been developed to meet the demands of serious riders in the UK whilst offering exceptional value for money. The components themselves come directly from factories/workshops from a range of manufacturers. Where necessary, they have been modified to meet the demands of UK riding conditions. I have not given the full details of all the modifications here. All components have a 2 year warranty. All of the wheels themselves are built in the UK by DCR wheels to the standards my customers have come to expect. The builds have a lifetime warranty. Each wheel is built to within 0.1mm, on a P and K Lie truing stand, tensions are measured with either a calibrated Sapim Tension meter or a Sapim calibrated DT Swiss tension meter. Each wheel is thoroughly stressed and rested to ensure it is ‘settled’ before dispatch. It is important appreciate the value of a good build; it adds a goo d deal of reliability and performance to the setup and can only be achieved with precise tooling. You can mix and match DCR components with other manufacturers if you wish to obtain different and at times higher performing or more economical combinations. The DCR Premium range is our range of performance focused, versatile rims. These are rims which could be used in racing conditions but would also be suitable for everyday use. The range offer three depths and disc brake and rim brake versions. They are all tubeless compatible and made using a range of cutting edge composite techniques and materials. this is the most versatile and most popular version that we sell. It is the workhorse and we have seen it used in a broad range of applications. It comes in a disc brake and rim brake version and we have seen them used in everyday riding, road racing, cyclocross and endurance events. Disc brake – the disc brake versions are differnet to the rim brake versions. They are a different finish, although the profile and mold is the same. They do not have a braking surface. 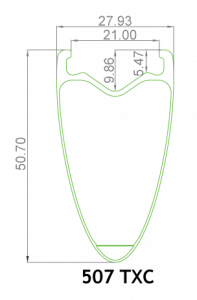 Often on carbon disc rims, the rims themselves have a braking surface essentially burried beneath a top cosmetic layer of carbon, these rims are built as disc rims from the ground up. The wall there are slightly thinner as they do n ot need to deal with heat or wear and that makes the rims lighter. They also look more stealthy for being a full continuous tangent UD finish and they are made using a different, tougher, lower temperature tolerant resin as they are not expected to deal with heat from braking. 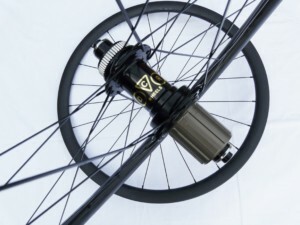 This profile has a more consistent weight for disc brake and rim brake but all of the features that are applicable to the 35mm range are also applicable here. The rims themselves are around 450g/rim. Disc is about 10g/rim lighter. 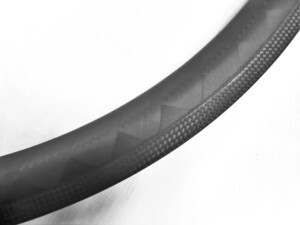 The profile has a thinner sidewall and is therefore not quite as durable on rim brake as the 35mm profile. The rim offers a very impressive depth:weight. This is the latest addition to the range, also available in disc/rim brake weighing 480g/490g respectively. The rim is less snub nosed in profile than the 35mm. That makes the rim aerodynamically faster as a profile but less suitable in certain conditions. However, despite its depth and profile, the rim is remarkably stable for what it is. Also, being a deeper rim, it is a lot more imposing as a profile than the other profiles. 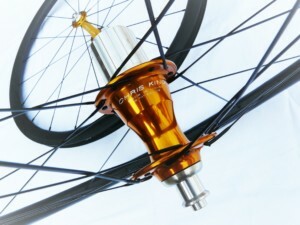 The profiles and finishes to not affect the final cost of the wheelsets. So if you wanted a reference for prices with the 51mm rather than the 35mm, the price will be identical and you only need to add around 100g overall to the total wheelset weight. We do still have a number of DCR Jersey rims in stock, pre-dating the Premium range. If you would like some of these at a more economical price point, please get in touch to check stock availability. Some of the range will continue into the future, including 60mm and 88mm profiles and some tubular rims in shallower profiles as well. The DCR radical rims come in two profiles – 30mm and 46mm. They are called radical because their construction uses 3 different mixes of carbon fibre, all wraped around a solid, structural foam core. They allow for a weight reduction, although they are not as versatile or as stiff as the premium range. Please contact for further details.